Buck 5 Click is a high-efficiency buck (step-down) DC/DC converter, which can provide digitally adjusted step-down voltage on its output while delivering a considerable amount of current. 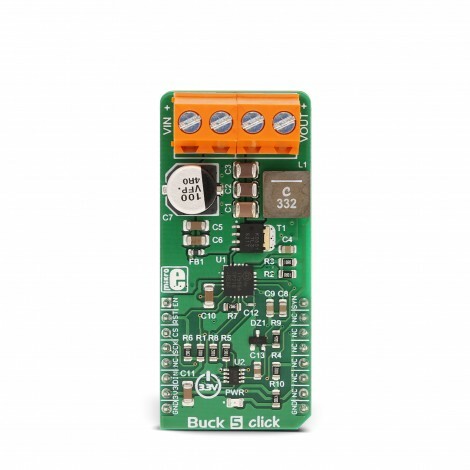 Buck 5 click accepts a wide voltage range on its input - from 5V to 30V. The output voltage may be adjusted via the SPI interface, in the range from 0.9V to approximately 5.5V. This Click board™ utilizes the MAX17506, an integrated high efficiency, synchronous step-down DC/DC converter with internal feedback compensation, from Maxim Integrated. 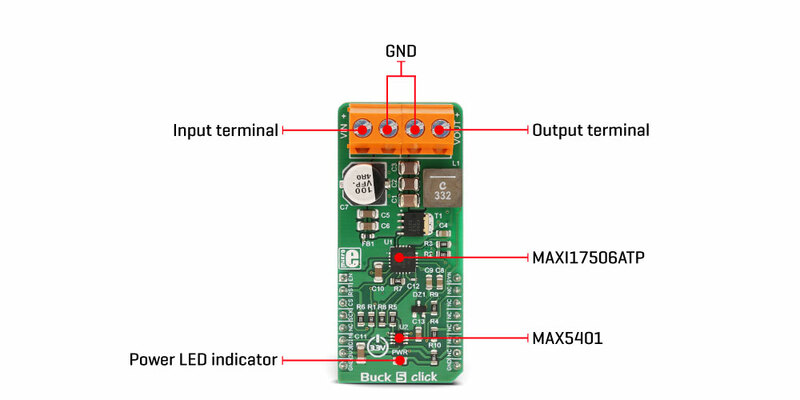 In addition, the MAX5401 digital potentiometer with SPI Interface is used on the feedback loop allowing digital control of the output voltage. 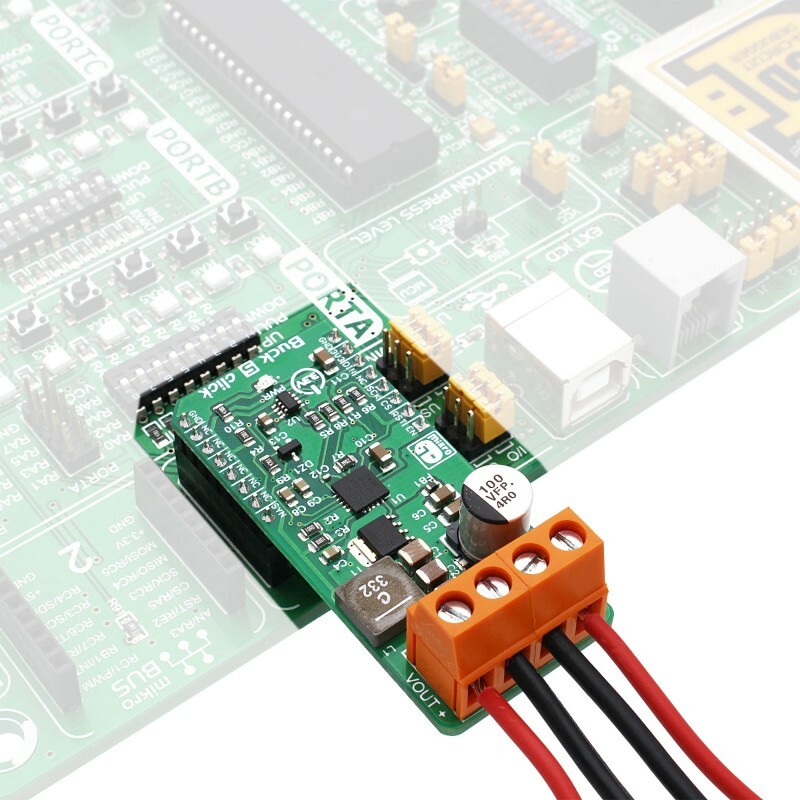 This Click board™ is very useful for the development of applications that require programmed reduction of a wide input voltage range, so it can be used to power low voltage digital ICs. Features, such as the low dissipation due to high efficiency, three different operating modes, overcurrent, undervoltage and thermal protection, output voltage monitoring pin, make this Click board™ very reliable power source for a range of applications, such as the distributed power supply regulation, wall transformer regulation, single board systems, general points of load, and similar applications. 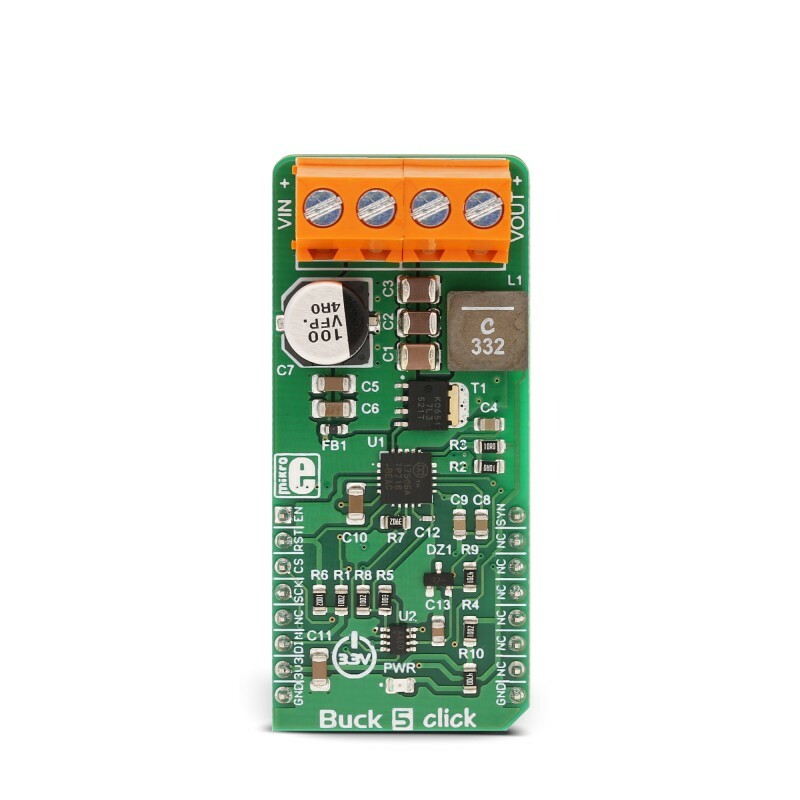 Buck 5 click is equipped with the MAX17506, a high efficiency, synchronous step-down DC/DC converter with internal compensation, from Maxim Integrated. This is an advanced step-down converter IC with an integrated high-side MOSFET, which requires a minimum number of external components, thanks to the internal feedback loop compensation. It utilizes a peak-current-mode control architecture. While the high side MOSFET is open and the current through the inductor ramps up, an overcurrent event will cause the MOSFET to close, preventing this current to become dangerously high. If there is a short circuit condition on the output, the device will reattempt to start after a timeout period, and if the condition is still present at the output, it will be turned off for another timeout period. To allow adjustment of the output voltage via the SPI interface, the MAX5401, a 256-tap digital potentiometer with a SPI Interface made by Maxim, is used on the feedback loop. It is used in the place of the fixed voltage divider found on the reference design of the MAX17506, regulating the output voltage to a programmed value that way. As a result, by sending a digital value through the SPI interface to the MAX5401, it is possible to control the output voltage level in the range from 0.9V to 5.5V. While operating normally (PWM mode), the high and the low side MOSFETs are switched synchronously with the signal from the internal PWM generator, causing the current through the inductor to ramp up and down, regulating the output voltage that way. The lower pulse width (duty cycle) of the PWM signal, results in a lower voltage at the output. The low side MOSFET is placed outside of the IC, allowing less dissipation on the DC/DC converter IC. The DCM mode is the compromise mode between PWM and PFM modes. The low side MOSFET is still not used for light loads, but the PWM pulses are not skipped, and the IC constantly drives the high side MOSFET. This mode produces ripple at the output but it is slightly less efficient than the PFM mode for light loads. Different modes are selected by the MODE/SYNC pin. By default, the IC is set to work in DCM mode, with the pull-up resistor. The MODE/SYNC pin of the IC is routed to the mikroBUS™ PWM pin (labeled as SYN), allowing the MCU to control the mode. When this pin is set to a LOW logic level, the constant frequency PWM mode is set. The same pin (MODE/SYNC) can be used to synchronize the switching frequency of the converter IC (fs), when needed. This frequency is determined by the 39K resistor to about 480 kHz. However, the frequency can be synchronized with an external source in the range from 1.1 x fs, to 1.4 x fs. The #RESET pin of the IC is routed to the mikroBUS™ RST pin. This pin signalizes problems with the output voltage. The pin is driven to a LOW logic level, when the output voltage drops under 92% of the nominal value, or during the thermal shutdown. It is an open drain output and it is otherwise pulled to a HIGH logic level (when not asserted). To enable the buck converter IC, a HIGH logic level needs to be present at the EN pin of the IC, routed to the mikroBUS™ AN pin (labeled as EN). 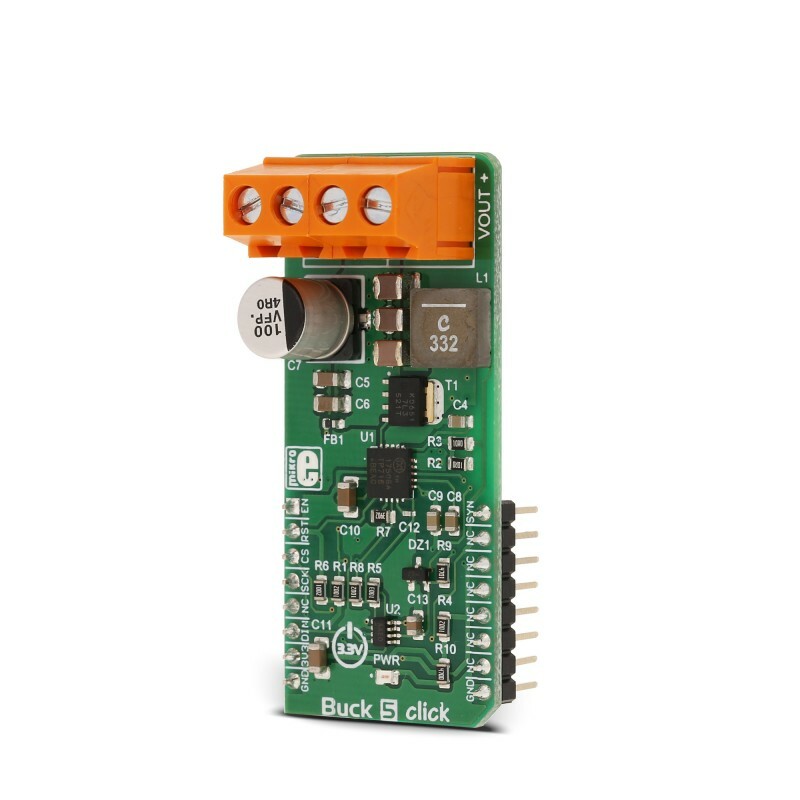 This allows the MCU to effectively control the Power ON function of the Click board™. When the IC is enabled, the LED indicator labeled as EN will indicate that the IC is activated, and the step-down conversion is in progress. Soft-start circuit prevents high inrush currents by introducing a ramp-up of the output voltage, from 0V up to the nominal value. On-board modules Onboard modules	MAX17506, a high efficiency, synchronous step-down DC-DC converter with internal compensation, from Maxim Integrated; MAX5401, a 256-tap digital potentiometer with SPI Interface, from Maxim Integrated. This table shows how the pinout on Buck 5 click corresponds to the pinout on the mikroBUS™ socket (the latter shown in the two middle columns). We provide a library for the Buck5 Click on our LibStock page, as well as a demo application (example), developed using MikroElektronika compilers. The demo can run on all the main MikroElektronika development boards. Initializes and defines SPI driver and driver functions which can use for power supply control. This library offers a choice to set maximum output voltage, which can be between 1V and 5.5V. For more details check the documentation. void buck5_powerOn() - Function for power ON chip. 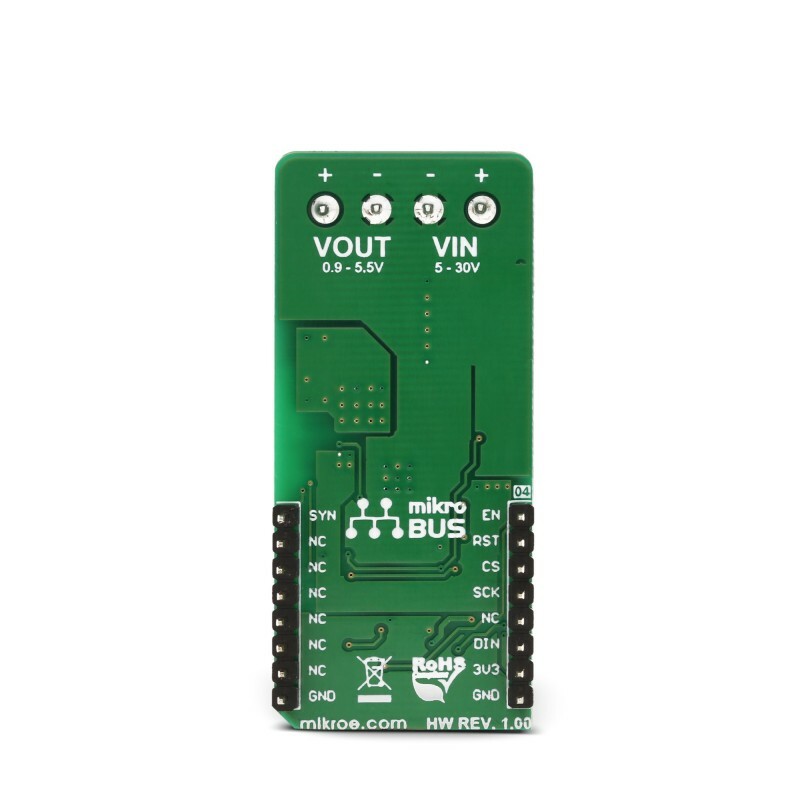 void buck5_reset() - Function for reset chip. void buck5_setOutputVoltage(uint8_t voltage) - Function for setting maximum output voltage. System Initialization - Initializes SPI module and AN pin, RST pin, CS pin as OUTPUT and PWM pin as INPUT. Application Initialization - Initializes driver init, power On-chip and reset Buck 5 click. Application Task - (code snippet) - Sets 3 different output voltage every 2 seconds.